RedWolf Airsoft is now having a Cyber Monday Special Deal! This deal will only last for 1 day and will end at the same time as Black Friday Sale ( December 1st, 2015)! 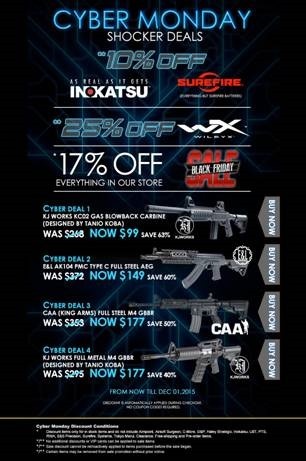 On top of the 17% Off discount, not only we will now have discount on exclusive brand such as Inokatsu, Surefire, and Wiley X; but we will also have door busting discounts on 4 specific airsoft guns! Only available while stock last!